Photos by Tanya Kauffman and the Great Swamp Conservancy Swamp Snappers Camera Club. Information provide by the Great Swamp Conservancy. (Bucephala albeola) - Bufflehead dive for aquatic invertebrates, crustaceans, and mollusks. They typically swallow their food while still underwater. Dives last on average about 12 seconds and rarely more than 25 seconds, typically staying on the surface another 12 seconds or so before diving again. Bufflehead forage in open, shallow water over sparse submerged vegetation or over mudflats that would be exposed at low tide. On freshwater they mostly eat damselfly and dragonfly larvae, midge larvae, water boatmen, mayfly larvae, caddisfly larvae, large zooplankton such as amphipods, and snails and clams in winter. They eat some plant matter in fall and winter, mainly seeds of pondweeds and bulrushes. In saltwater, Bufflehead eat shrimp, crabs, amphipods, isopods, snails, mussels, herring eggs, sculpins, and ratfishes. Downy ducklings sometimes dabble at the surface rather than diving. Bufflehead breed near ponds and lakes in boreal forest and aspen parkland of Canada and Alaska, with isolated populations in the western United States. The Bufflehead’s breeding range is limited by the distribution of Northern Flickers, which are their main source of nesting cavities. Bufflehead are North America’s smallest diving duck; they benefit by using old flicker nests that larger ducks such as goldeneyes and mergansers cannot fit into. In winter they occur mainly near the coast (although they can be found in smaller numbers inland). They use shallow, sheltered coves, harbors, estuaries, or beaches, avoiding open coastlines. Inland, they use ponds, lakes, impoundments, or bays along slow-moving rivers. 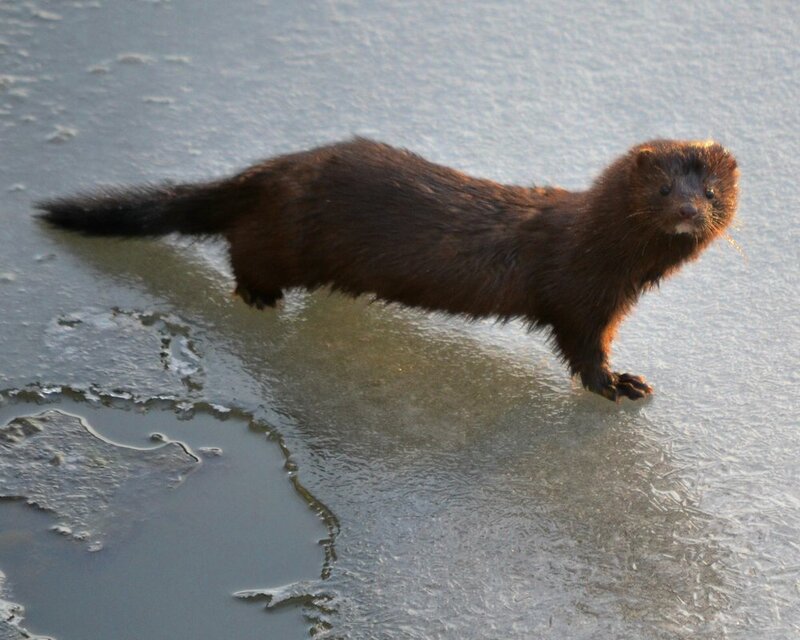 During spring migration they spend time on major rivers or valley lakes, often in the first spots to become free of ice. (Branta Canadensis) - In spring and summer, geese concentrate their feeding on grasses and sedges, including skunk cabbage leaves and eelgrass. During fall and winter, they rely more on berries and seeds, including agricultural grains, and seem especially fond of blueberries. They’re very efficient at removing kernels from dry corn cobs. During summer, and increasingly at other times of year, Canada Geese are fairly easy to see, swimming in open water, resting near shore, or grazing on lawns or farm fields. They are often heard flying above, by day or night; if you study their honks you may notice the difference by sound when other species of geese or swans are flying. Canada Geese live in a great many habitats near water, grassy fields, and grain fields. Canada Geese are particularly drawn to lawns for two reasons: they can digest grass, and when they are feeding with their young, manicured lawns give them a wide, unobstructed view of any approaching predators. So they are especially abundant in parks, airports, golf courses, and other areas with expansive lawns. (Anisoptera) are characterized by long bodies with two narrow pairs of intricately veined, membranous wings that, while generally transparent, may have colored markings. The front and rear wing pairs are shaped differently, and they rest with their wings spread horizontally, rather than held vertically against each other. Dragonflies have huge bulging eyes that occupy most of the head, giving some a field of vision approaching 360 degrees. As well as being extremely agile fliers, they are also among the fastest insects. Dragonfly wing muscles must be warm to function optimally, and so, if cool, the insect often engages in wing-whirring and basking in the sun to generate heat before taking flight. The dragonfly’s speed and agility contribute to its being one of the most effective aerial predators. Small flying insects are the usual fare, but some dragonflies regularly consume prey that is 60 percent of their own weight. In their larval stage, which can last up to two years, dragonflies are aquatic and eat just about anything—tadpoles, mosquitoes, fish, other insect larvae and even each other. At the end of its larval stage, the dragonfly crawls out of the water, then its exoskeleton cracks open and releases the insect’s abdomen, which had been packed in like a telescope. Its four wings come out, and they dry and harden over the next several hours to days. Dragonflies are expert fliers. They can fly straight up and down, hover like a helicopter and even mate mid-air. If they can’t fly, they’ll starve because they only eat prey they catch by grabbing it with their feet while flying. They’re so efficient in their hunting that, in one study, the dragonflies caught 90 to 95 percent of the prey released into their enclosure. Some adult dragonflies live for only a few weeks while others live up to a year. Dragonflies are a great control on the mosquito population. A single dragonfly can eat 30 to hundreds of mosquitoes per day. (Ardea herodias) - Whether poised at a river bend or cruising the coastline with slow, deep wingbeats, the Great Blue Heron is a majestic sight. This stately heron with its subtle blue-gray plumage often stands motionless as it scans for prey or wades belly deep with long, deliberate steps. They may move slowly, but Great Blue Herons can strike like lightning to grab a fish or snap up a gopher. In flight, look for this widespread heron’s tucked-in neck and long legs trailing out behind. Great Blue Herons eat nearly anything within striking distance, including fish, amphibians, reptiles, small mammals, insects, and other birds. They grab smaller prey in their strong mandibles or use their dagger-like bills to impale larger fish, often shaking them to break or relax the sharp spines before gulping them down. Great Blue Herons live in both freshwater and saltwater habitats, and also forage in grasslands and agricultural fields, where they stalk frogs and mammals. Most breeding colonies are located within 2 to 4 miles of feeding areas, often in isolated swamps or on islands, and near lakes and ponds bordered by forests. Scan shorelines, river banks, and the edges of marshes, estuaries, and ponds across much of the U.S. for this tall, slow-moving heron. Great Blue Herons also feed in meadows, farmland, and other open fields. Some colonies or “heronries” are found near developed areas; look for the herons’ bulky stick nests high in trees. And once you recognize their slow wingbeats and massive silhouettes, you’ll start to notice these birds in flight high in the sky as well. (Lophodytes cucullatus) - Hooded Mergansers dive to catch aquatic insects, crayfish, and small fish. Males court females by expanding their white, sail-like crests and making very low, gravelly, groaning calls. Hooded Mergansers fly distinctively, with shallow, very rapid wingbeats. Look for Hooded Mergansers on small bodies of freshwater. In summer, these small ducks nest in holes in trees, often near freshwater ponds or rivers. For winter, they move to larger bodies of freshwater, marshes, and protected saltwater bays. 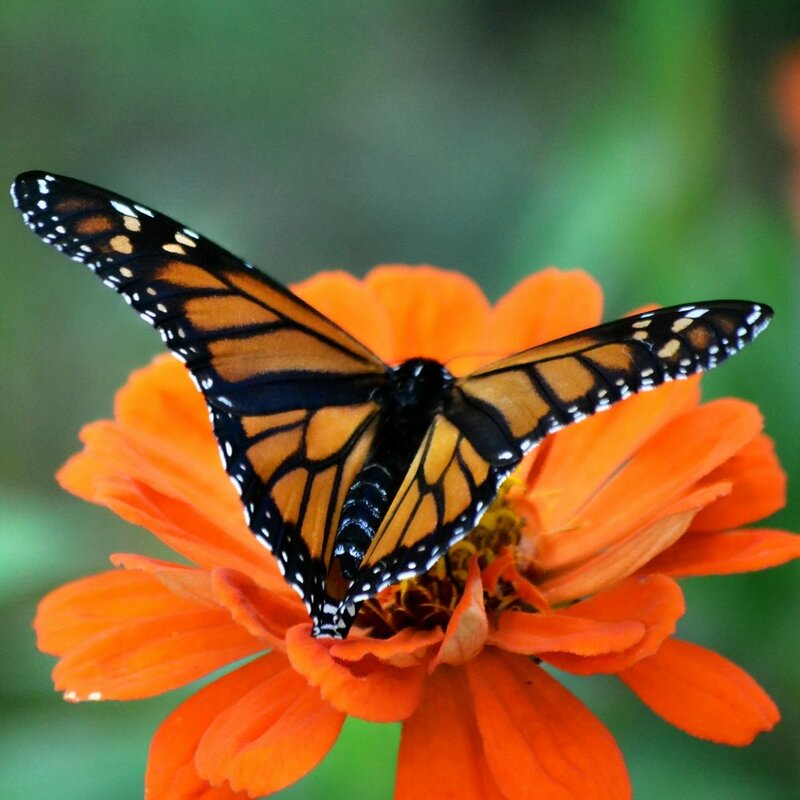 (Danaus plexippus) The monarch may be the most widely recognized of all American butterflies with its distinct orange, black, and white wings. While beautiful, this coloring actually sends a warning to predators that the monarch is foul tasting and poisonous. Found throughout the United States, as well as Mexico and Canada, one of the most notable characteristics about the monarch is the astonishing 3000 mile journey some will make in the fall to their wintering grounds in the Sierra Nevada Mountains of Mexico or to southern California. The scientific name means "sleepy transformation”, which evokes the species' ability to hibernate and metamorphose from caterpillars to butterflies. Adult monarchs possess two pairs of brilliant orange-red wings, featuring black veins and white spots along the edges. Males, who possess distinguishing black dots along the veins of their wings, are slightly bigger than females. The monarch will always return to areas rich in milkweed to lay their eggs upon the plant. In their larval stage, monarch caterpillars feed almost exclusively on milkweed and as adults get their nutrients from the nectar of flowers. The milkweed actually contains a poisonous toxin that is stored in monarch’s bodies –this is what makes them taste so terrible to predators. Millions of monarch butterflies migrate every year to warmer climates for the winter. During the migration tens of thousands will land on a single tree in certain areas along their path. Monarchs can travel between 50-100 miles a day and it can take up to two months to complete their journey to winter habitats. Monarchs inspire people, and their habitat supports pheasant, quail, waterfowl and many other species. The numbers of these amazing creatures have decreased significantly over the past 20 years, partly due to habitat loss and fragmentation throughout their range. You can help to save the monarch by planting milkweed and nectar plants native to your area, and by gardening organically. Northern Leopard Frog (Lithobates pipiens), named for the array of irregularly shaped dark spots that adorn their backs and legs. They are greenish-brown in color with a pearly white underside and light-colored ridges on either side of their backs. They are considered medium-size, reaching lengths of 3 to 5 inches, nose to rump. Females are slightly larger than males. Their range is most of northern North America, except on the Pacific Coast. They generally live near ponds and marshes, but will often venture into well-covered grasslands as well, earning them their other common name, the meadow frog. Leopard frogs will eat just about anything they can fit in their mouths. They sit still and wait for prey to happen by, then pounce with their powerful legs. They eat beetles, ants, flies, worms, smaller frogs, including their own species, and even birds, and garter snakes. (Mustela erminea) - Weasels are small mammals with long bodies and necks, short legs and small heads. They are closely related to ermine, ferrets, polecats and minks — all members of the Mustela genus — and are in the same family (Mustelids) as badgers, wolverines and otters. Weasels are adaptable and live all over the world. They are usually brown, grey or black with white or yellowish markings. All weasels become all white in the winter, and are then referred to as ermine. The most common is the short-tailed weasel. It can be found in North America, Europe and Asia, in regions as far north as the Arctic. Their homes include marshes, scrubs, hedgerows, alpine meadows, riparian woodlands and riverbank habitats. Weasels' diets usually consist of rats, mice, voles and rabbits. Frogs, birds and bird eggs are also on the menu, from time to time. Their small, thin bodies allow them to squeeze into tight spots to reach small prey. As nocturnal animals, weasels sleep during the day and are active at night. Most of a weasel's time awake consists of hunting, storing excess food and eating. Their bodies don't store fat, so they need a constant supply of food to provide enough energy. Though weasels can dig their own burrows quite quickly, they sometimes take over other animals' burrows and make them their own. They have even been known to take over termite hills. (Marmota monax) - A rodent of the family Sciuridae, belonging to the group of large ground squirrels known as marmots. It was first scientifically described by Carl Linnaeus in 1758. These rodents live a feast-or-famine lifestyle and gorge themselves all summer to build up plentiful reserves of fat. After the first frost, they retreat to their underground burrows and snooze until spring, drawing their sustenance from body fat. While hibernating, the animal's heart rate plunges, and its body temperature is not much warmer than the temperature inside its burrow. Groundhog hibernation gave rise to the popular American custom of Groundhog Day, held on the second of February every year. Tradition dictates that if a groundhog sees its shadow that day, there will be six more weeks of winter, though such a prediction seems a sure bet over much of the groundhog's North American range. In the spring, females welcome a litter of perhaps a half dozen newborns, which stay with their mother for several months. Groundhogs are the largest members of the squirrel family. Though they are usually seen on the ground, they can climb trees and are also capable swimmers. These rodents frequent the areas where woodlands meet open spaces, like fields, roads, or streams. Here they eat grasses and plants as well as fruits and tree bark. Groundhogs are the bane of many a gardener. They can decimate a plot while voraciously feeding during the summer and fall seasons. (Aix sponsa) Beautiful and unique, this duck of woodland ponds and river swamps has no close relatives, except for the Mandarin Duck of eastern Asia. 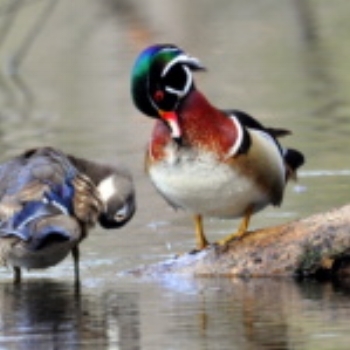 The Wood Duck population declined seriously during the late 19th century because of hunting and loss of nesting sites. Its recovery to healthy numbers was an early triumph of wildlife management. Their diet consists of seeds, aquatic plants and their seeds, insects and crustaceans. Acorns are a major part of their diet in many areas and they also feed on waste grain. Wood ducks forage in water by taking food from the surface, submerging the head and neck, and occasionally up-ending. They can also walk on land. Courtship displays of males involve postures that show off colorful plumage. Nest sites are in large tree cavities near water, up to 65' above ground. The cavity is lined with down. They sometimes build nests in hollow fallen logs, barn lofts, or crevices in rocks. Wood ducks will use artificial nest boxes, even when these are placed low and in open marsh. (Chelydra serpentina). 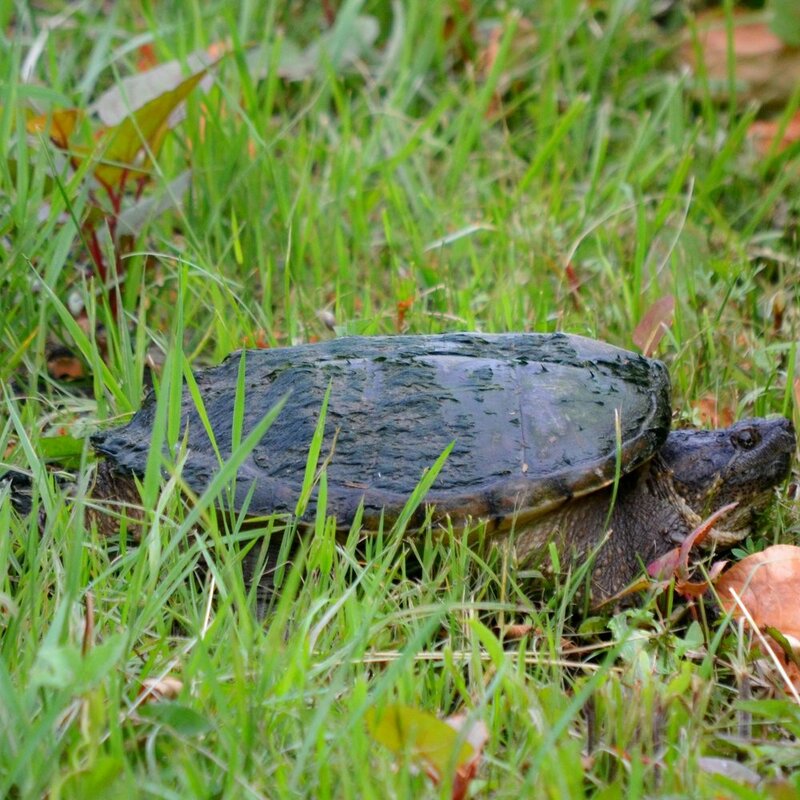 Easily recognized by its large head, long saw-toothed tail, stocky legs with large claws, and the jagged, saw-toothed rear edge on its dark shell, the snapping turtle is New York State’s largest freshwater turtle, with shell lengths up to 16 inches. Known for its defensive nature, this turtle will attack on land, but prefers to flee in water. Highly aquatic, this species is found in freshwater and brackish marshes, ponds, lakes, rivers and streams. Snappers often scavenge, but they also take live food ranging in size from small invertebrates to young waterfowl or small fish.